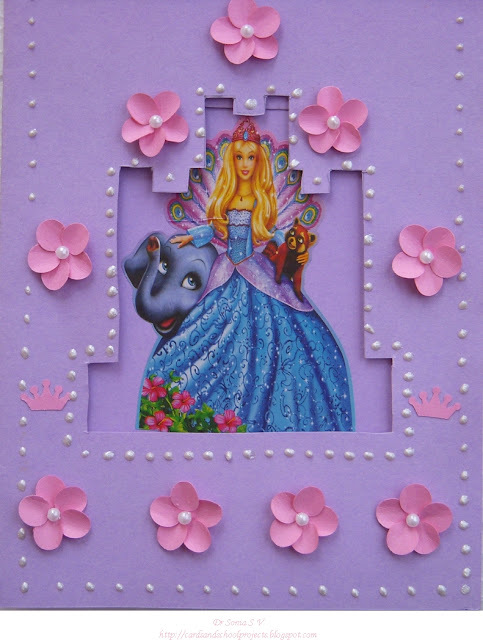 Barbie is quite popular with little girls nowadays and my little one is no exemption.This is a typical little girls card A Barbie Princess! 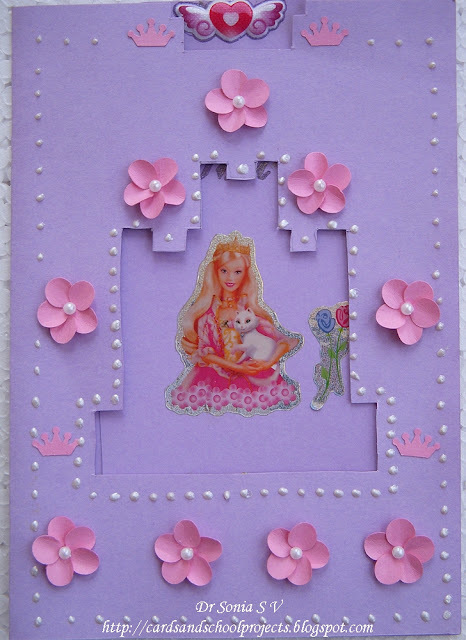 My daughter is so involved in card making that she even decides what theme birthday card she wants for a particular friend based on the the friends likes and dislikes!Here is the fun Sliding Barbie Princess card we made. The Barbie card slides up to reveal another Barbie princess underneath.I made the aperture in the shape of a castle . 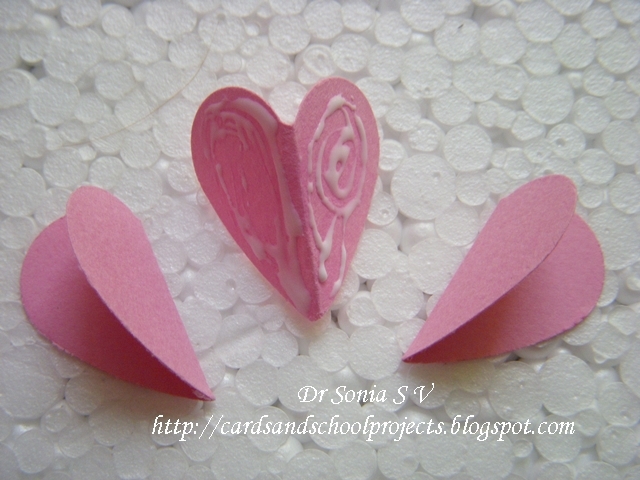 My daughter helped to stick the pink handmade paper flowers on her castle! 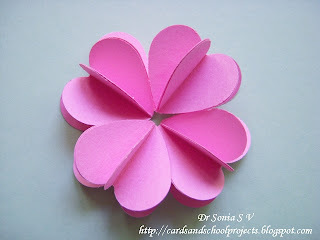 These are the flowers used to decorate the card. 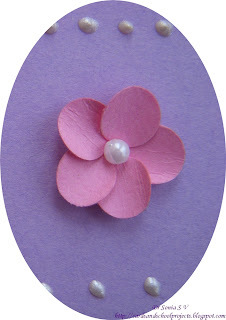 They were made out of small circles glued together and a white pearl placed at the center.Here is the link to the circle flower tutorial.The white shiny dots are pearly white 3 D glitter. 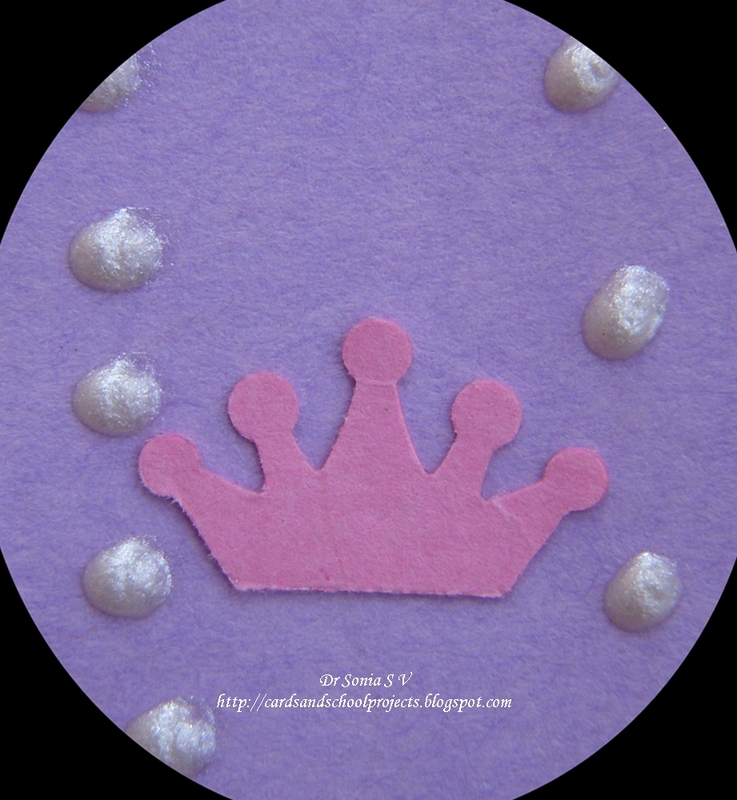 This crown was cut using a new Crown punch I couldn't resist buying . This is an interactive card. I love making a card with an interactive and unusual mechanism. 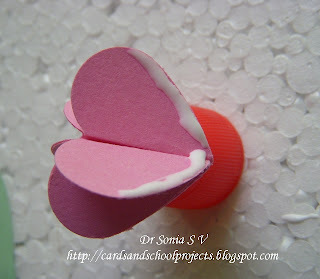 This is a fun card which on pulling the tab on one side make 2 cards slide out from opposite ends.Its really magical. 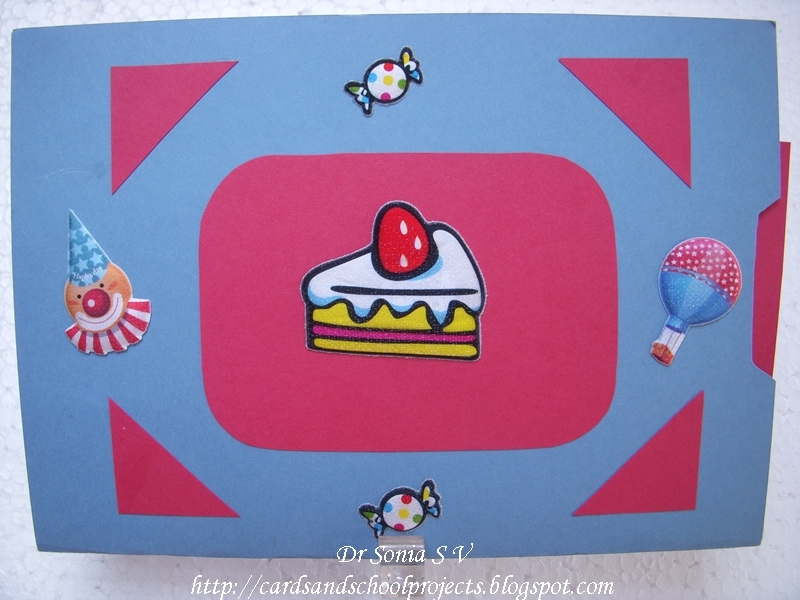 It is easy to make and instructions can be found on many places on the net.The images on this card are exclusively stickers. 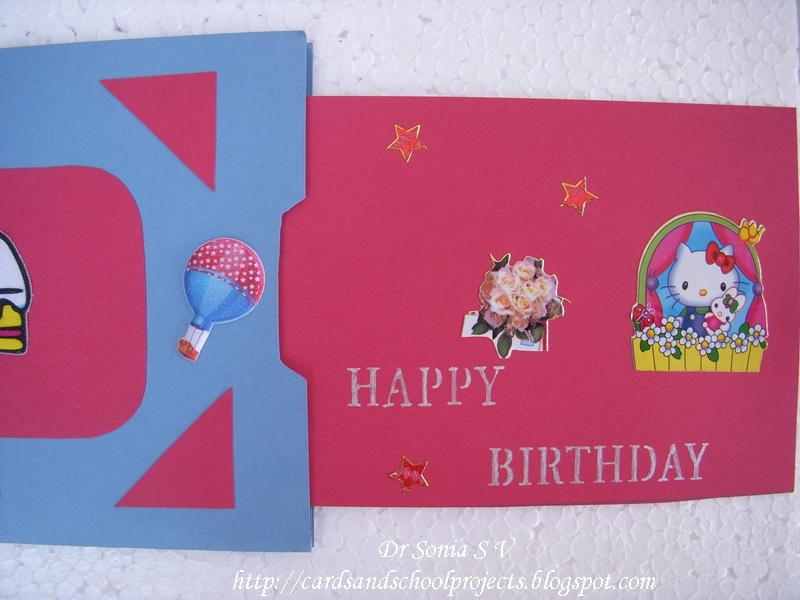 I used puffy 3 D stickers on the top panel and flat stickers on the sliding card panels. 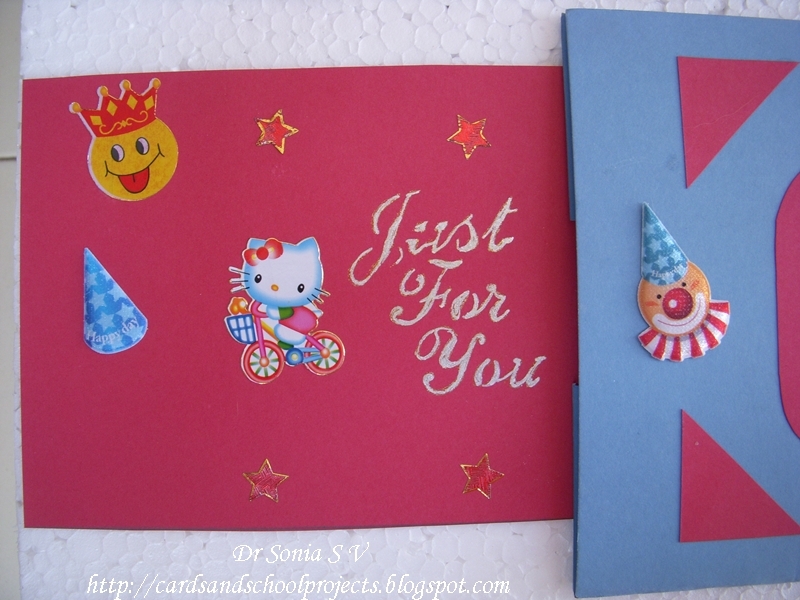 This type of card cannot handle 3 D embellishments as the slider mechanism will not work well with heavy and protruding decorations. 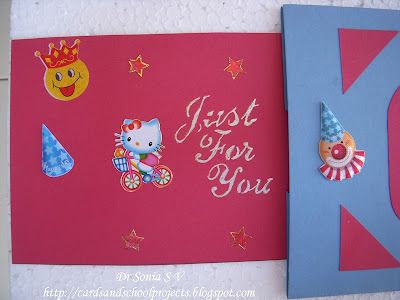 We have not decided who to give this card to. It should be a fun card for one of my daughter's friends. You may be having lots of CDs you have no use for. 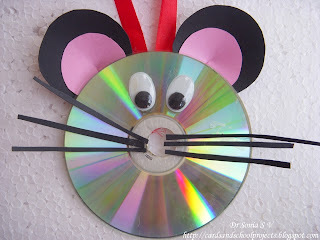 Here is a simple yet cute craft to recycle CDs. 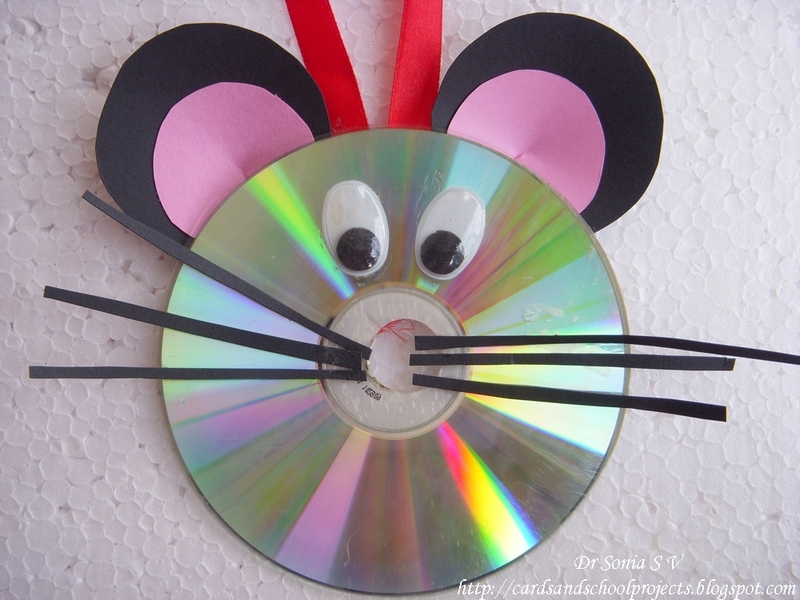 This recycled CD Mouse craft was made by my 4 year old daughter in Summer camp at Planet kids . 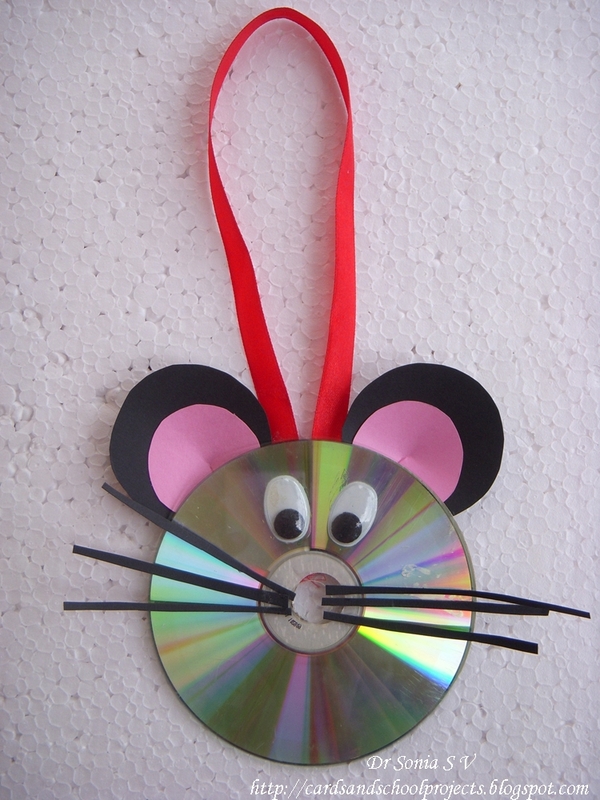 My daughter told me its to hang in our car but we felt little mouse should stay in our home and gave the little mouse a place in our drawing room! 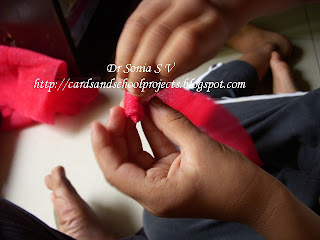 To make the ears cut out 2 large circles from black paper -with younger kids cut the circles out for them.Older ones can trace around a cup and cut out the circles. How about a more elegant recycled CD craft ? 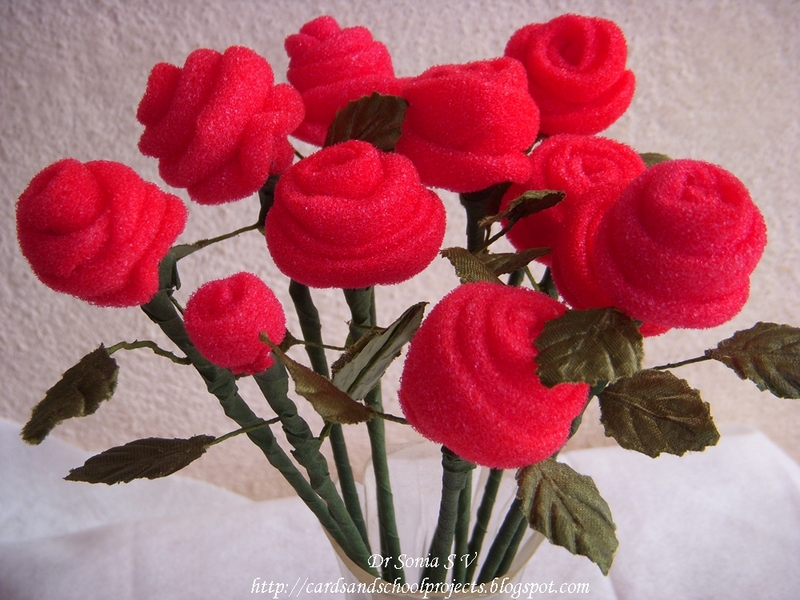 This is a bouquet of homemade Sponge Roses . 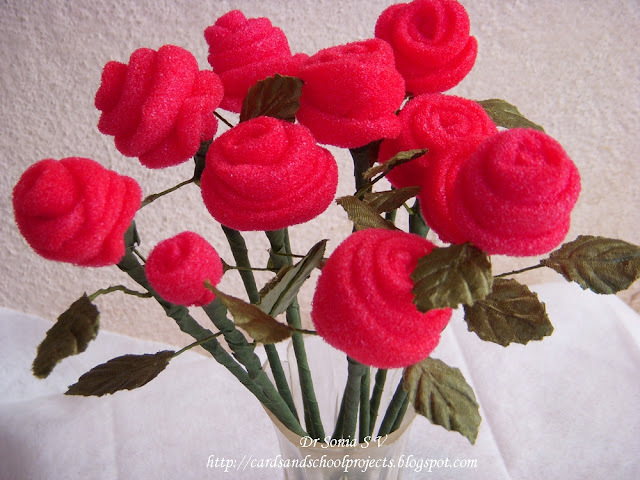 Check out how to make these sponge flowers. The small rosebud on the bottom left hand corner is my 4 year old daughters idea and creation! I am on a flower making spree! Making flowers from sponge is perhaps a forgotten craft. 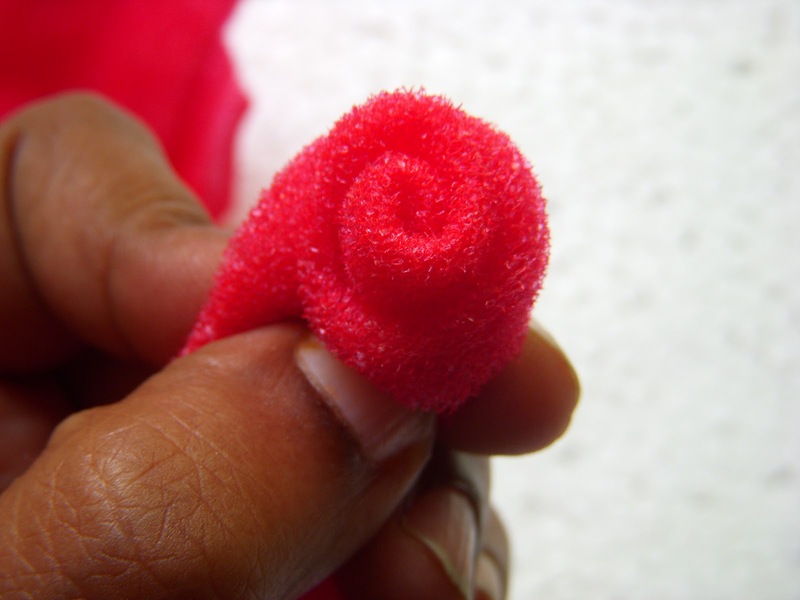 I remember seeing many sponge creations in my childhood but hardly anything now. 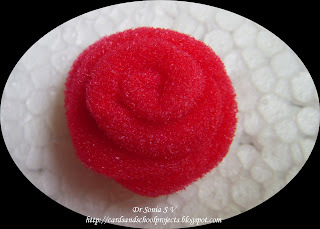 Online too there are very few sponge flowers on Crafting blogs. 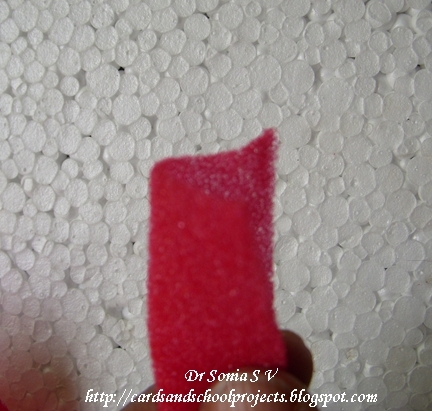 While spring-cleaning I discovered some sponge sheets I had bought long back and decided to put them to use! 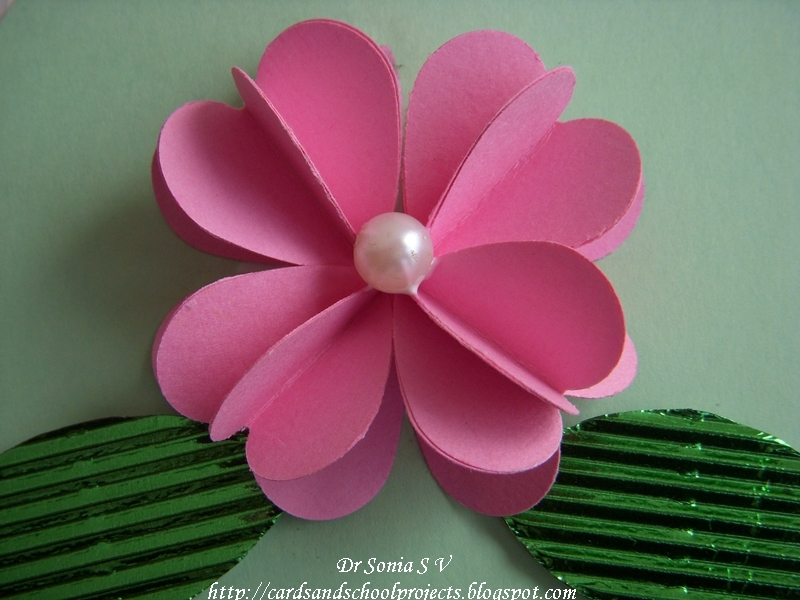 The flower I am going to show you is super easy to make. My daughter has made one too as you can see! If you are crafting with kids let them roll the flowers but they will need help tying the final rose bud as the floral wire can be sharp for little fingers. Sponge Sheet - comes in so many delightful colors. 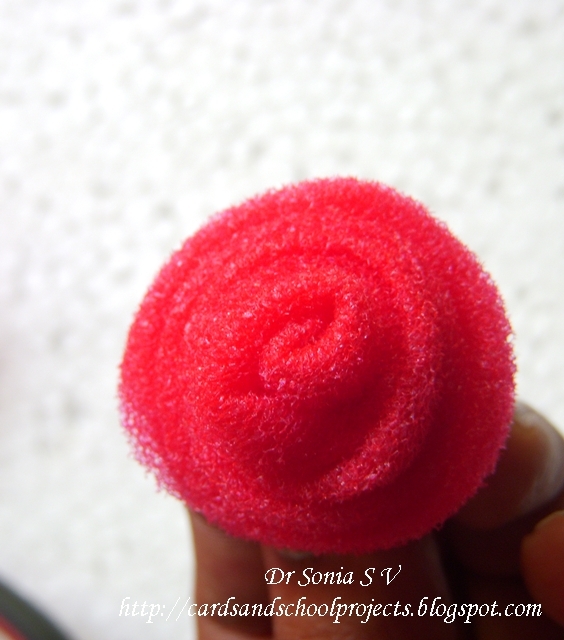 Width: Don't cut it too narrow as it makes working with the rolling and securing the sponge flower difficult. 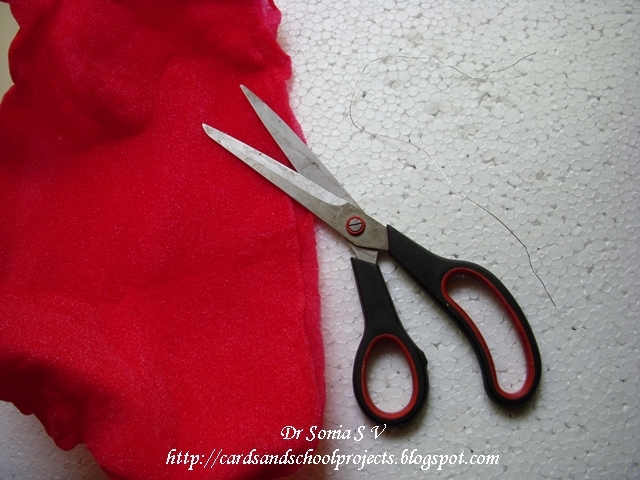 Cut the width between 4- 5 cm. 3.Start rolling from one end. 4. You can add a twist if you like by making a 90 degree turn as you go along. 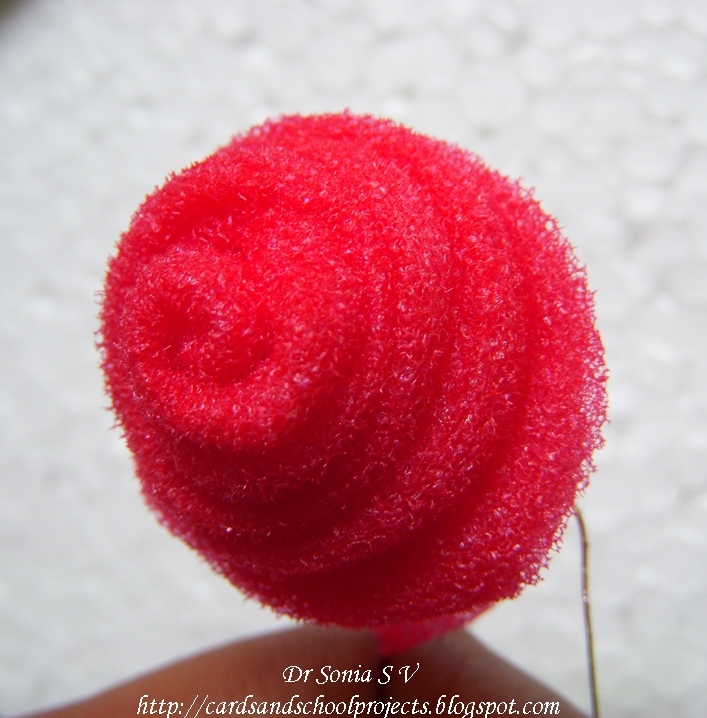 It gives some added dimension but the Rose bud looks lovely even with simple rolling. 5. 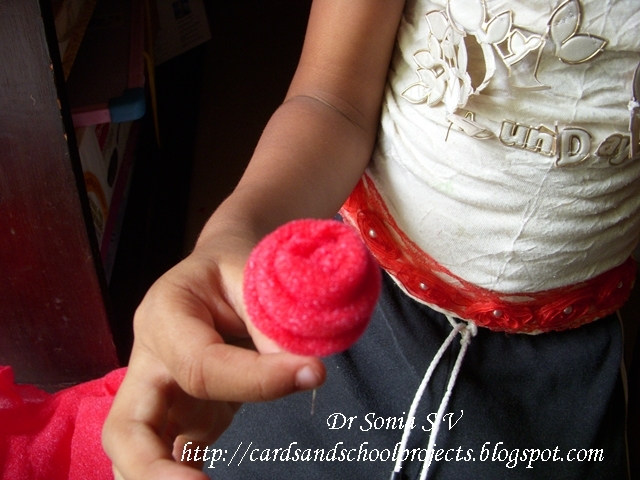 As you roll you can shape your Sponge Rose Bud Flower.Keep a Tight hold on the flower base as you roll it. 6. 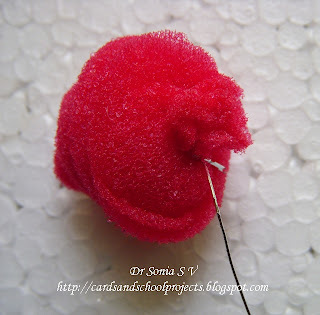 Take Floral wire and loop it loosely around the base of your Sponge rosebud. Alternately if you like stitching you can secure your sponge rose using a needle and thread to secure the base. Tips:Don't make the wire loop too tight as it can cut through the fragile sponge.Making it too tight can also change the shape of your flower. 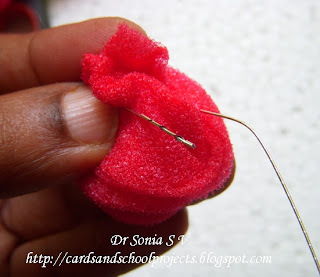 Don't worry its easy to get the hang of it even at your first attempt!You can stitch the base if you don't have floral wire.Using floral wire makes it very easy. 7. 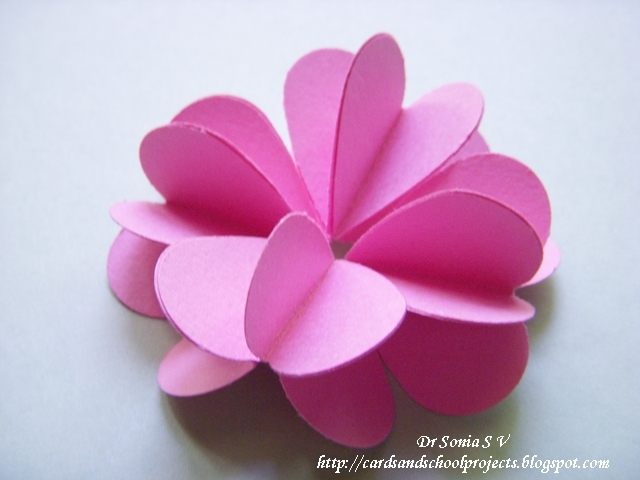 You can cut off the Floral wire or keep it and use your rosebuds however you want. Some ideas to Use your Sponge RosebudsMake a brooch - In this case you can stitch the base to make it sturdier. 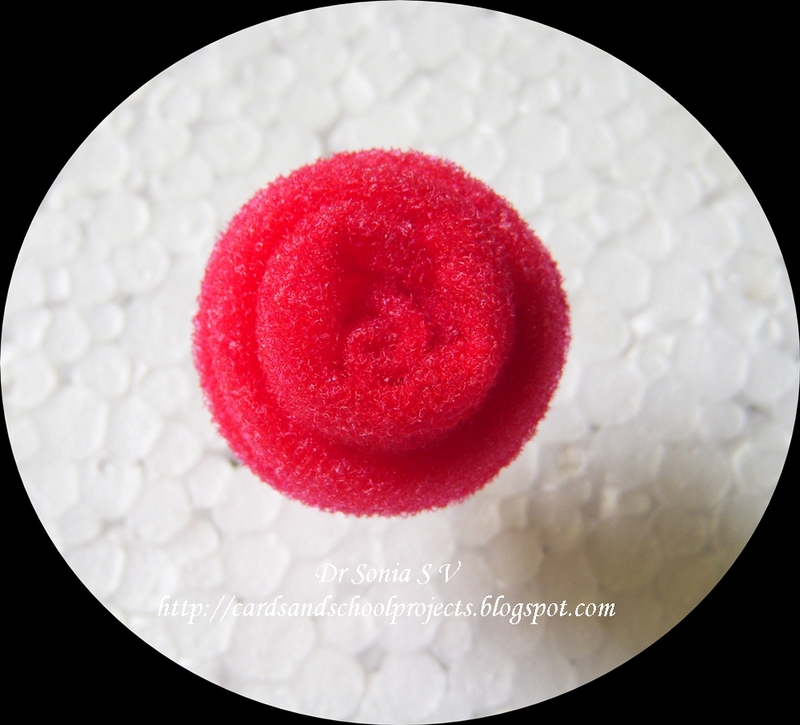 This is my daughters Sponge flower. See how cute it is. 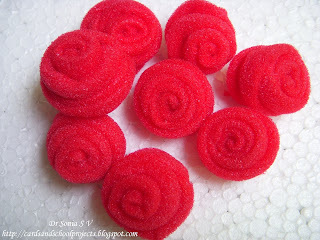 These are ideal flowers for little hands to make as they dont squash like paper and just rolling is required! 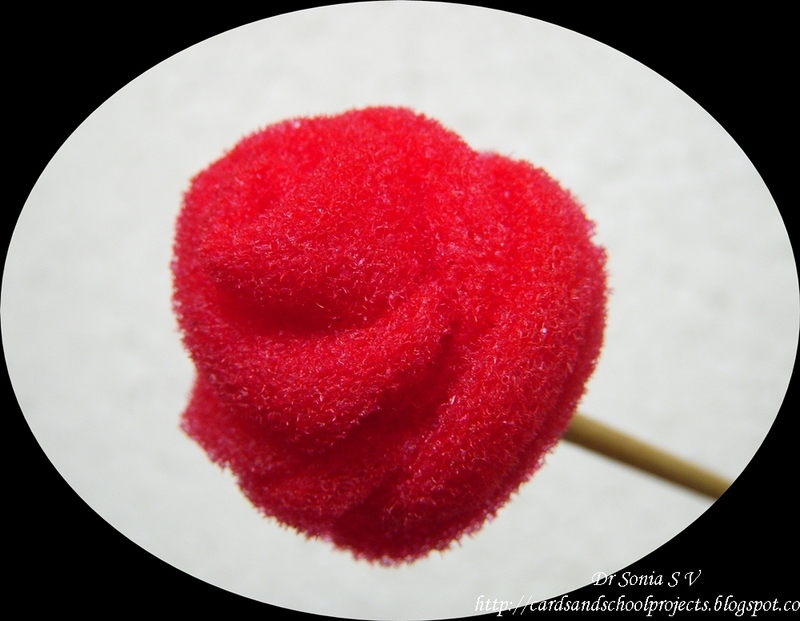 This is one of the sponge flowers made by my little girl! Our bouquet came together in no time! A bouquet of Sponge flowers! Where to buy sponge sheets ? : Since sponge craft was an art popular in the 1980s and fallen out of memory it may be difficult to get sponge sheets these days.Your local fancy store may be stocking these if you are lucky!Otherwise keep a look out for sponge sheets that come as packaging when you buy electronic items or crockery. Getting craft supplies in India is a challenge . 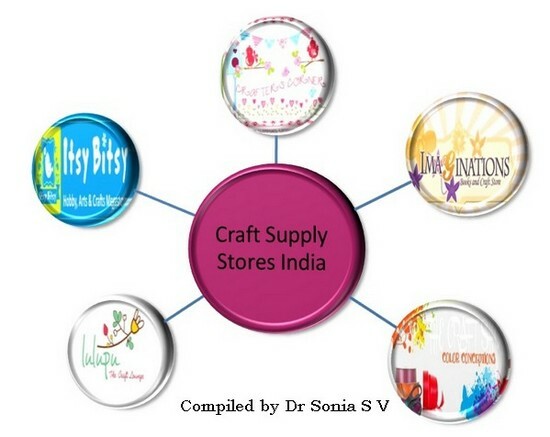 In this post I would like to share with you some of the craft stores in major cities of India and online craft shopping portals . Check back often on this post as I shall keep updating this based on new shops I discover or new buying experiences. Whether you consider it pricey , high quality etc and if your craft store is a friendly neighborhood store do tell us if you have to bargain! What I have found when buying craft materials be it card stock , papers, punches or the fancier cutting dies...prices vary tremendously from shop to shop, city to city ,seller to seller and even within the same shop or seller from time to time!! Craft sellers especially online sellers keep having sales and discounts which may be seasonal/festive or as a competitive strategy[to compete with other sellers having the same product]. 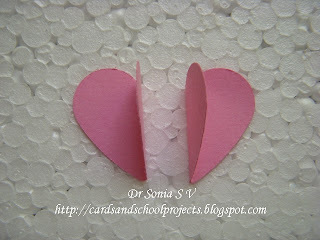 Often craft supply sellers lower their prices by several hundred rupees to beat the competition or clear their stock [ If you are buying when the stuff goes on sale its ok but how about the other side of the coin?I have personally been unluckily affected by this trend when just days or weeks after I buy a product the same seller decreases the price to a considerably lower rate]. So if you are planning to buy fancy stuff online do explore prices, shipping charges,discounts etc at the different seller's sites. And if its something new and you dont know comparative costs, do resist and wait for at least a few weeks as prices tend to fall when the competition joins in !! I have been guest designer/designer for some of the online shops but the view expressed here is in no way influenced by that ! 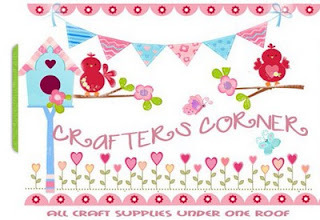 Crafters Corner is fantastic craft supply store with a flourishing online shop. Owned by crafter Shalini Mittal . Her shop has a huge range of imported craft supplies ranging from exotic punches and dies to paper cutting machines. I bought some fantastic Cheery Lynn dies from Shalini in Nov 2012 when she had a sale for them.I was super pleased by the prompt service--I got notification when the money was transferred ,when the parcel was sent with courier tracking number and delivering in 1 working day !I was thrilled that her courier charges are nominal [always a concern with online shopping!] and she even waived off the courier charge since it was my first purchase. One more thing I especially like about her is she is very very prompt in responding to product queries be it on facebook or email. 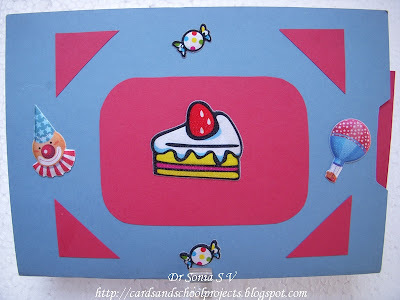 A very intelligent entrepreneur...the crafters corner team send me a discount coupon to tempt me to spend on my birthday..and yes I couldn't resist the offer! For the die hard crafter her store is a must visit ! If you want imported craft goodies this may well be your first stop as the range is huge! Often has the lowest price for any particular imported craft item! Tip : Keep a watch on their facebook page as many a times discounts and giveaways are announced on facebook rather than on the website! 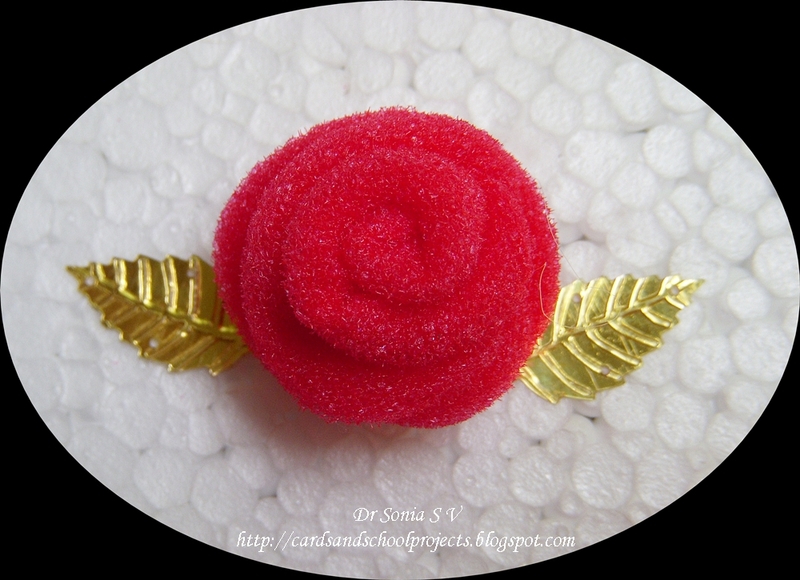 The first item I purchased from Priya were Sizzix scallop oval dies and I was very much impressed with her professional dealings .Since then I have bought from her several times and her service is always super fast. Very fast service.She will ship you the product in no time at all! Shipping rates are nominal and averages just 45 rupees and many a times she has waived off shipping too! Tip :Since her products are often unique and her prices competitive...her stuff sell out pretty fast. So you have to be fast to get the good bargains! 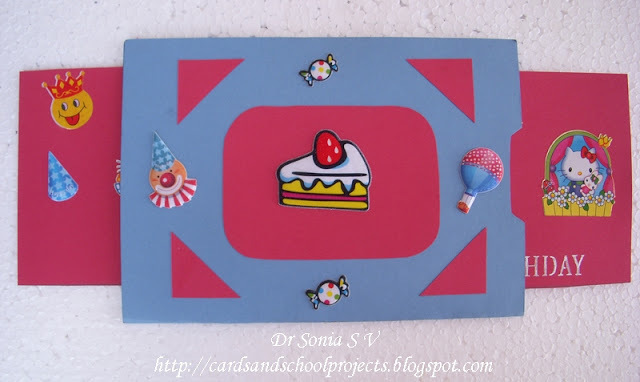 Itsy Bitsy has physical stores in some cities in India and also an online shopping portal.Has products for different crafts. Some products are only sold online while some are only sold in the physical stores. They have sales when they open a new shop . Keep a watch for their big sales...that is when you can splurge! Owned by talented crafter Maninder Kaur from Punjab. Maninder is a crafter at heart and apart from having a lovely craft store she also teaches specialty crafts like mixed media and decoupage. I was extremely attracted to the super gorgeous metallic embellishments Maninder stocks in her shop. She also has gorgeous pearl strings, hard to get pom pom lace and several unique embellishments. Her prices are economical and her website user friendly. She'll message as well as email you all the courier details and there is a definite personal touch in all the dealings......something I loved since I am an old school person who still likes to buy from a person rather than a website!! 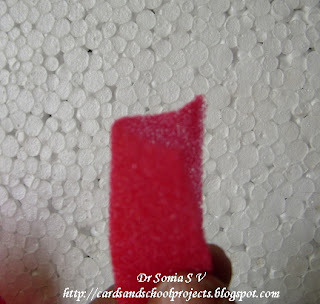 Something of special note is her meticulous packing...wooo not seen such beautiful packing in quite some time... each tiny embellishment was individually bubble wrapped and an MDF gate in my package had a triple protection packing of cardboard, thermocol and bubble wrap ! It felt so nice to see such awesome packing and care being taken to see that it reached the customer in perfect shape. Follow Rainbowcraftykari on Facebook as that is where special discounts are announced on a regular basis! Managed by crafter Aditya Gupta.I made my online purchase from him in Nov 2011 and I was so happy as it was my first online purchase .I had been very traditional so far and not purchased anything online but my apprehensions were all allayed with this experience! His website is professional and his service fast and efficient!You get an order confirmation,various payment options including an easy Bank transfer option which I had opted for.I was asked my preference of courier, permission to ship and even received a little surprise package! I bought a Scorpal and Friskars tweezers from his shop and they arrived well packed and promptly.My first online experience was a success! One of the best things about dealing with Aditya is he sends you prompt mails or sms when he receives the money, then again when he dispatches the products ..he is very prompt in giving courier tracking numbers and packs the products well. Only a limited variety of Punches and dies . I was most attracted to her shop for the economically priced punches and the interesting embellishments! I didnt buy online from them but picked up the stuff when I went to Mumbai. The young couple who run the business have some exquisite stuff which are not too hard on your pocket.I took quite a number of punches and got a good discount too. I must especially appreciate the fact that when I reported some issues with 4 punches I had bought they immediately replaced the same without any fuss even taking the trouble to travel hours in Mumbai traffic to deliver the new punches. I bought some exclusive fantastic shiny papers,Pie Lane products and many Jef punches from Jovi. 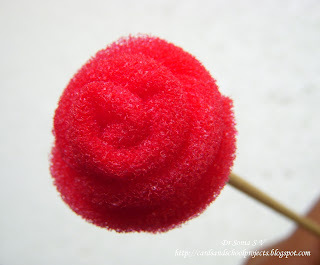 Since she is a very creative crafter herself she stocks stuff which are in vogue! They keep having sales and then its time to really stock up on craft supplies! 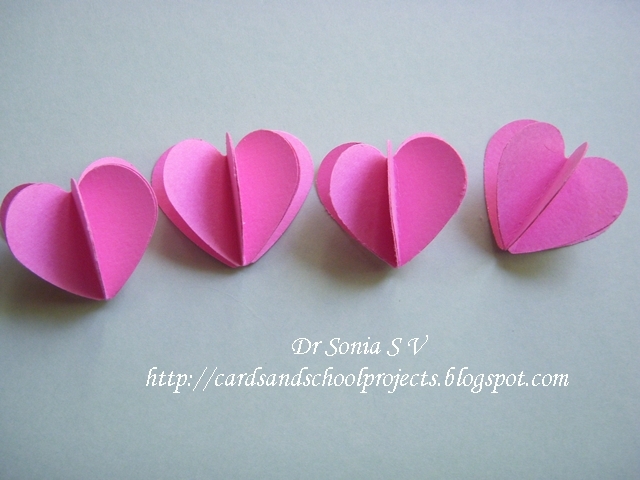 080 6452 1296 ‎.This is an exclusive craft material supply store. It has 3 floors! Something for every hobby be it beading, painting,clay crafting,baking,paper crafting or if its something for a party or school project this is the place to go to! 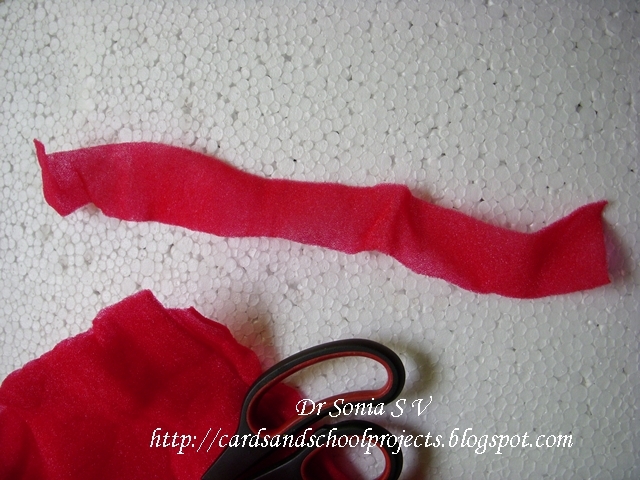 Craft Materials: Varies. I have picked up some great bargains here. Availability is no guarantee. 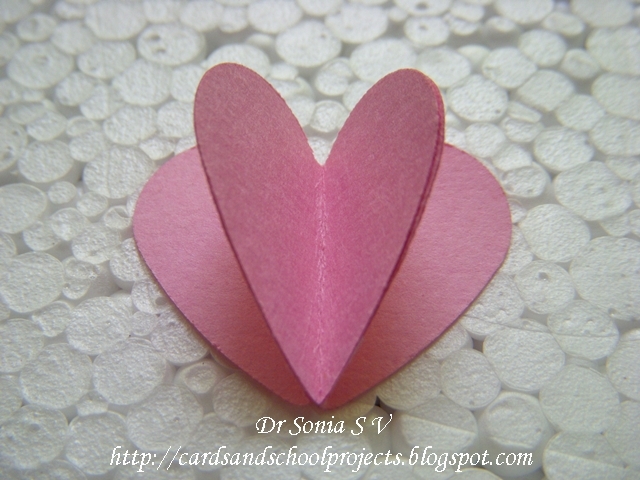 Corrugated paper, card paper, Foam sheets and felt sheets+ some value for money Stickers have been my finds here. Glue dots are also usually available. Its a small shop but don't let that fool you its a treasure trove and you have to watch your pocket! Punches:Huge collection of Jef and Punchbunch punches.Now stocks Ek Success and Martha Stewart punches. 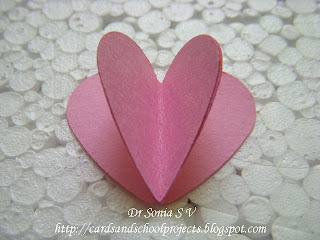 Quilling: Strips in various widths, lots of colors including shaded , metallic , graded shades. 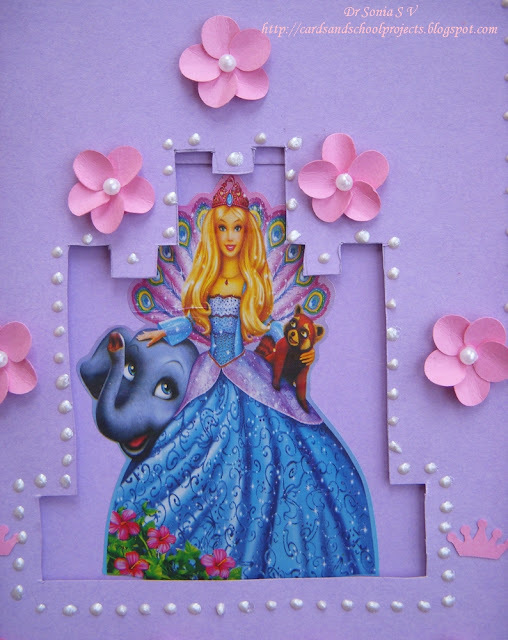 Quilling comb, crimper,cork board,Quilling fringer. 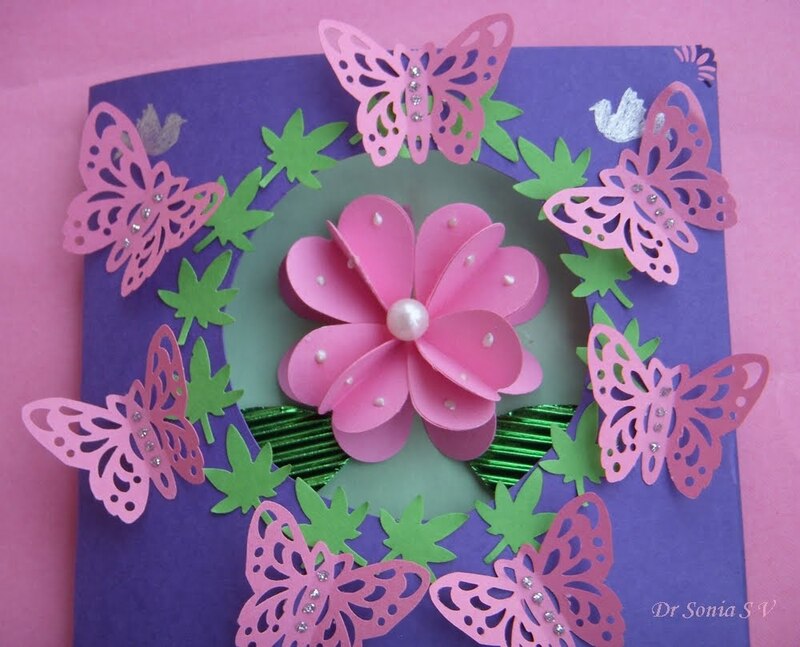 Variety of craft kits if you want to learn a craft :Parchment craft kits, quilling kits,Cut and tuck kits,iris folding kits.Emboss painting kits. Good collection of stencils-Local,fevicryl . Lot of spray paints.Acrylic Paints in large bottles are very economical. Tanjore Painting ready made kits. Parchment craft paper including colored ones, grids,needles, embossing tools and embossing mats. Good collection of rare craft books but these are imported so expensive - many books on punch craft and quilling. Our Own Store ,Commercial Street.327,3rd cross ,Narayana Pillai Road,Commercial Street. The board has faded away and you might miss it if you are not careful.Its quite near the main commercial street Road. Ravi craft Store,Commercial Street,Kalyan Complex,2nd Cross road, Commercial Street. Walkable distance from the Our Own store so be sure to check both out if you specifically want something. Beads,Pearls.Beautiful Embroidered stuff.Huge collection of ribbons. Some pretty fabric.Googly eyes in round and oval shape price at present Rs 5 a pair.Flower making fabric limited colors and stamens and pips less variety the last time I went.No paper. Tips: If you are an avid seamstress this will be a treasure trove for you. 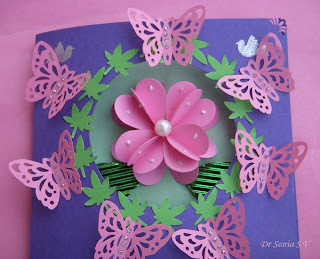 For the paper crafter you will get some exquisite ribbons and embellishments. Do bargain! Has lots of satin as well as plastic ribbons, Embossing kits,Embosser in several designs.Foam stickers at great rates.A small selection of Craft punches at reasonable rates. SreeMurugan Bottle Stores,OPH Road -Perpendicular to Commercial street. Near Taj Hotel. How to reach there- a nightmare to drive into if you have a car--we parked at Unity Building JC road and took an auto. Huge variety of crafting materials- would be good place to go when you need items in bulk for a craft class or workshop or order. 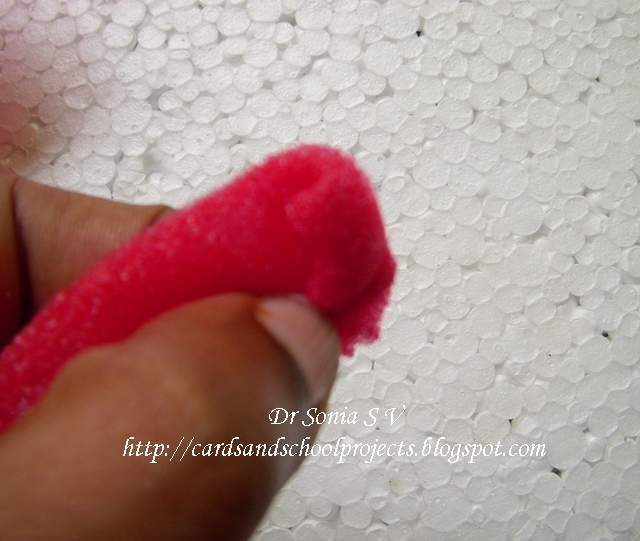 Punches are limited.Large foam sheets in many different colors . Jewelry making: lots of stuff but on price and quality comparison I found Itsy Bitsy superior! Flower making stuff:some unique stuff including wire, pollens, stockings, sponge, net. They sell most things whole sale so for the "non die hard" crafter it may not be worth the trouble to endure the market place hustle and bustle to reach there! If you are a regular customer they will even procure stuff for you! Cons: Some of the staff have no knowledge about the products stocked! Raja Thread Stores, off Ranganathan street, T.Nagar (in the lane beside Textile India),Beads, jewelery pliers and findings, canvas, paints, gold/ colored papers (not open on Sundays.) candle making and other craft kits.Small shop BUT well stocked with craft supplies. Pandian Thread Stores, off Ranganathan street, T/Nagar (opposite Raja Thread Stores):They stock jewelery supplies like seed beads, beads, wire etc. Also have a good collection of mehandi pattern books, knitting needles and yarn. Flower Bazaar near Currimbhoy’s (Paris Corner)- stiff buckram and cotton gaada cloth -many small shops selling handmade lace by the metre,wooden buttons,coconut shell buttons, iron-on applique patches, embroidery thread, candle making kits, crystals, flower making wire, beads, tiny bells and ribbon rosettes..Note: always take a guide with you! Sornam Stores (Pondy Bazaar)-open on Sundays Plain pillow covers in pastel shades, plain towels and Aida Fabric also known as Matty cloth in about three different shades in addition to white. Went there in Dec 2012 and was amazed at what can be stored in a small space-- a crafters paradise-- If you want imported crafting tools this is the place to go!Huge variety of imported punches, cuttlebug, fiskars tools,ribbons,quilling kits, clay modelling tools,Some unique imported quilling kits and 3 D paper craft kits. Large variety of papers too!Also stocks some Pie Lane stuff. 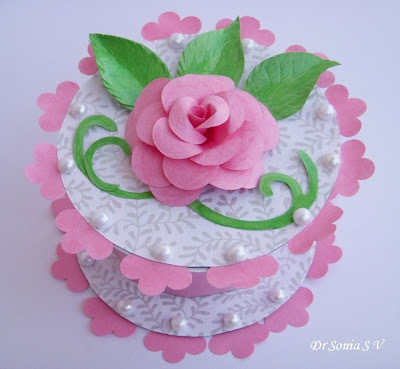 Nagashri Arts - Paper crafting and other art and craft supplies Located at Poonam Nagar , Andheri East, Mumbai. Ships all over India too. Please do post your favorite Indian craft supply stores here. 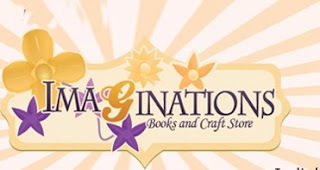 NB: The sole purpose of this post is to give information to crafters.Though I have done Guest Posts and Design team work for some of the shops above, I do not receive any incentives for listing a shop or writing a review in this page. This large 3 D flower is made by sticking hearts together. 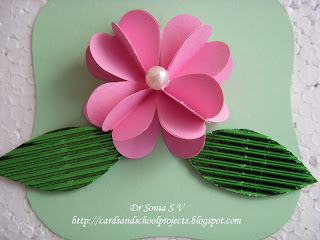 How to make a 3 D flower which you can use in your cards or as a decoration. Heart Punch- optional but if you have it , it makes your job easier! 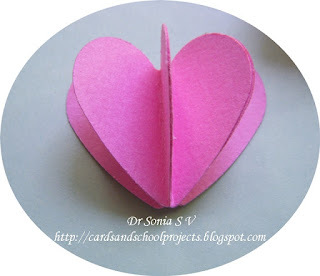 3.This is a 3 hearts 3 D heart which pops up and also folds flat .This can be used as such to adorn your cards and other creations for decoration. 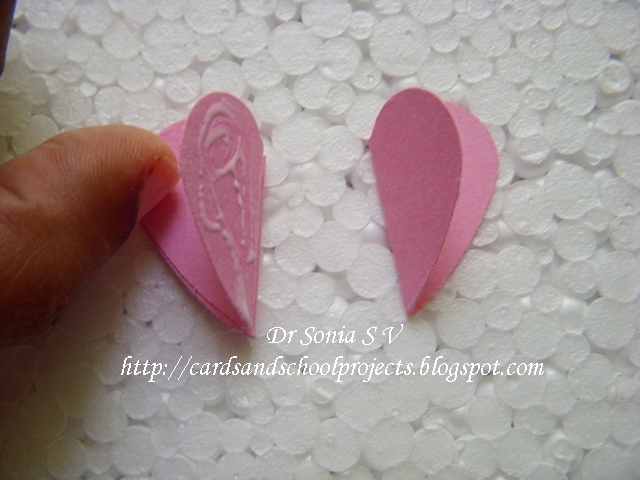 4.Apply glue to the undersurface of one end petal of the above and stick it to another heart. 6.Make 4 such petals using 16 hearts in all. Using a heart punch makes this a fast job. 8. Arrange your petals and allow the glue to dry.My favorite glue is white glue which dries transparent. 9.Put a bead,pearl,quilled shape at the center.I cut leaves from corrugated paper to complement the flower.Do try these flowers.